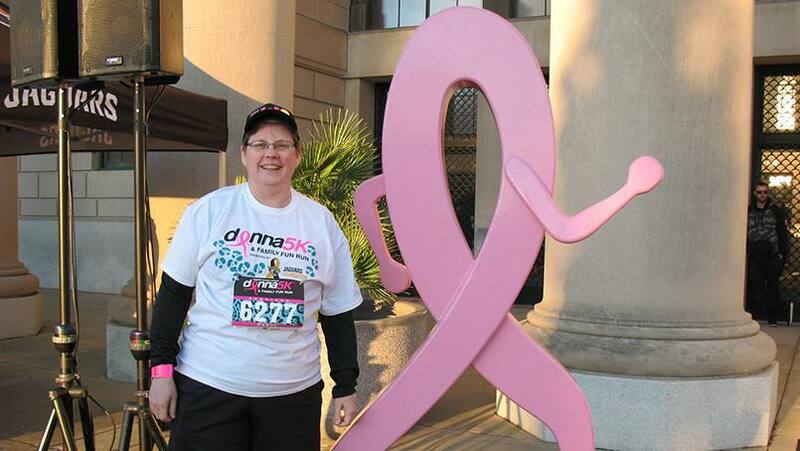 Editor’s Note: Carol Phillips is an IT analyst/programmer at Mayo Clinic's Rochester campus. . She shares her experience and why she travels to Florida to support the annual 26.2 with DONNA Marathon . My breast cancer journey started on April Fool’s Day — April 1, 2011. Only it wasn’t a joke. My routine yearly mammogram came back abnormal. And at age 50, I was diagnosed with Stage 1 breast cancer. I don’t remember much about my first appointment with the doctor. It was all a blur. The only thing I do remember was the doctor saying, “Mayo Clinic will get you through this process. We’ll work together as a team. You are truly in good hands.” As I walked out to the parking lot, though, I thought I had just been given a death sentence — and I wasn’t ready. I dreaded telling my parents that I had cancer. My mom had been diagnosed with multiple myeloma 6 years before and was losing her battle at that time. But I drove home to North Dakota that weekend to tell them. I wanted to reassure them that I was going to be OK. I held my mother’s hand and told her the doctors found the cancer early, that I was given a 98 percent chance of survival. “I am going to be ok,” I said. In May I had a lumpectomy. The cancer was very small, and the two lymph nodes I had removed were both negative. My doctors said I was very lucky to have the cancer diagnosed before it could spread. Three weeks later, I began a month of daily radiation treatments. When I finished, I decided to go back home to recuperate. I thought that being with family would be a good place to relax and help my body heal. Unfortunately my mom passed away that weekend. It became the toughest part of my journey not to have her with me. For support I turned to close friends and the American Cancer Society. I opted to get involved and volunteered for different events throughout the Rochester community, including Relay for Life, and I joined the committee for Making Strides Against Breast Cancer. Then, I met women from Join the Journey, a Rochester-based support group. 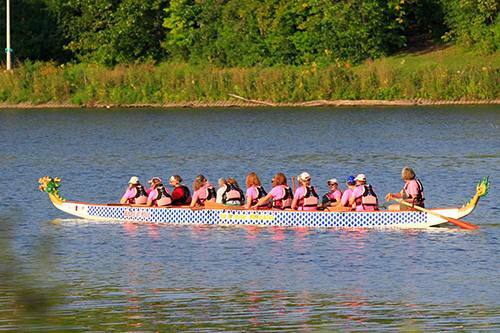 I started participating in various activities, including the Breast Cancer Dragon Boat Festivals many times throughout the summer. It was a wonderful experience, and the women gave me strength as well as many great friendships over the years. For the first time, I didn’t feel alone in my journey against cancer. Their support has been immeasurable. Mayo Clinic diagnosed my cancer early and literally saved my life. Since my diagnosis, I have had many opportunities to volunteer, and I knew that this would be an event that again would be life-changing. I learned that the 26.2 with DONNA is an organization doing incredible work for patients and families dealing with this disease in the Jacksonville, Florida, community. And it supported Mayo, too. I was excited to travel to Florida last February and volunteer. It was an amazing experience to be a part of something that truly united people from all over the world. Handing out water, giving the runners their medals, and giving breast cancer survivors pink carnations … these are some of my favorite memories from my trip. There was a power and energy throughout the whole day, which I will never forget. In May last year, I celebrated my five-year milestone. I completed all of my treatments and follow-up regime. Looking back, over the past few years, my life has changed in ways I never would have imagined. I believe I was given a second chance in life, and I’m grateful. I have experienced and done things that are totally out of my comfort zone. I believe that life is short and fragile, and it is important to live it to the fullest. Since 2017 marked the 10th anniversary of the DONNA, I decided to venture down to Florida again. Only this year, in addition to volunteering at the pre-race expo and at the finish line for the marathon, I will be participating in the 5K race. It is likely we all know someone affected by breast cancer. So I am challenging my friends and family as well as other Mayo Clinic employees to get involved. Volunteer. Walk or run. Or donate. If your situation allows, come down to Florida and volunteer your time, or sign up to join me on the race course. If travel isn’t in your future, consider registering for the virtual marathon. You can run or walk from anywhere – even Rochester or Arizona – and use my $10 discount code (MAYOVIRTUAL). Or consider a $10 donation to Team Mayo Clinic in honor of the 10th anniversary. Every dollar helps. And you’ll feel good knowing that 100 percent of these dollars will support the Donna fund to meet the critical financial needs of families living with breast cancer and come right back to Mayo Clinic for research. More than $3 million has been given directly to Mayo Clinic to date. I know first-hand what it means to hear those dreaded words, “You have breast cancer.” This disease has given me a new perspective on life, and I don’t want anybody to have to go through the journey alone. So for me, volunteering my time whenever and wherever possible to be supporting others is my key motivation. But this event is also an opportunity to celebrate life. I believe that when something bad happens, you have three choices: You can let it define you, let it destroy you, or you can let it strengthen you. I know I am stronger now than I was before. And I look forward to celebrating with thousands of other survivors and their families in Florida this February. Won’t you join me? To join Team Mayo Clinic, follow the registration prompts on the marathon website, and select Team Mayo from the drop-down menu. The password is "mayo" — all lowercase. Use the code "MAYOVIRTUAL" for $10 off Virtual Race Registration.